"I am concerned. I know God is in control of everything. I still have hope that God would open the doors for us. 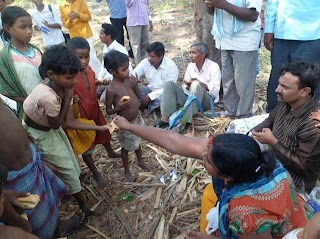 Being deep-rooted Christian, I am unable to compromise Christ for the sake of donations in India." Greetings to you in Christ name! I humbly thank you for everything that you are doing towards New Hope for Children Orphanages and Helping Hands India. I thank God for your partnership: your partnership lifted the condition and situation of Helping Hands India ministries. God heard our prayers and extended the grace and hope. We thank Big Family Mission which obeyed the call of the Lord and begun to cater the needs of HHI children, especially finding sponsors and helping us to build Rajoli Children’s Home. Through BFM God sent the Scott family who brought blessings, smiles and happiness in the lives of HHI ministries. We are very much grateful and honored to have your care and concern towards HHI ministries. HHI began in the year 2001. Since then God has been faithful to us in taking care of the needs and concerns of HHI. We witness He sends angels to lift us up in the time of needs and concerns. And He helped us to go to different people (Hindus, Muslims etc) to raise funds for the needs and concerns of HHI. Later, as need arose and call of God was obeyed, we extended the mission to Bhadrachalam, Rajoli, Ambur, and to widows and pastors. I am facing lots of problems and struggle. Recently, I pledged my wife’s family jewelry and took a loan, but God blessed us during the recent visit of the Scott family and we were able to pay the loan. Because we have not been able to raise funds locally, this month has become a total crisis for us. I could pay only rents, medicals, electrical, milk, water, vegetables, and for some of children’s education expenses. But I still have to take care for almost $5,000 in expenses. I am concerned. I know God is in control of everything. I still have hope that God would open the doors for us. Being deep-rooted Christian. I am unable to compromise Christ for the sake of donations in India. I haven’t paid salaries to staff yet. Of course they are too in need of funds to take care their personal needs. Pastors and widows depend only on our honorarium; I have no words for them. I have no one to share with but you. I thank God because apart from Him, He has given me grace to share with you. All these days I just kept these struggles within me and sometimes burnt out. I need your prayers. As I was praying, I am moved to share with you. Thanks for standing along. We are grateful. Please pray, care, and suggest. You can donate online via credit, debit, or ACH bank transfer, or print out our paper form and donate via mail. Please sign up to receive news updates from New Hope for Children Orphanages. Pastor George and his wife Jyothi are Poppa and Momma for over 130 children in New Hope Orphanages. Other ministries of Pastor George and Helping Hands India include widows aid, children's church camps, pastoral training, and church planting.To learn more about these other ministries, click here. Sponsor an orphanage child in India; child sponsorship that's different! Our children at 4 Christian orphanages are waiting to meet you! Our children are waiting to meet you! Choose and pray for one child! Keerthi needs new sponsor: will you rescue her today? Girls moving to new home: pray for Pastor George and family! Father paralyzed, mother abandoned him: Anil now knows the love of Jesus!